This post is a little different, as I developed this recipe as a collaboration with my old high school. I was contacted by a lovely woman named Garney, who works at the high school I went to, about a career board display she and some yearbook students were working on themed “Oh, the places you’ll go…” and they thought that this whole blogging and recipe-makin’ thing I do was interesting. The display went live today…and, seriously, who would have thought!? Especially among people who have become lawyers or are headed for medical school. Definitely not too-cool-for-high-school me. I went to a teeny high school, ECHS, in a speck of a town in the middle of Nevada. When I mean teeny, I mean my graduating class had 21 students in it. I did yearbook, the school newspaper, was a cheerleader, and worked at the community pool as a lifeguard. I was not cool at all and was a total awkward-weirdo…and I mean, I kinda still am, I’ve just embraced it. My favorite things to do included writing super-inaccurate-yet-fun horoscopes for the newspaper and using deadlines as an excuse to cut-out on PE, doing photo layouts for the yearbook, as a cheerleader I loved making huge hand-lettered signs for games, and working at the pool was pretty fun since a lot of my friends worked there too. Like many high-school kids, my free time was super important to me and I could often be found hanging out with my pals, driving around aimlessly, and drinking cherry-diet-pepsi’s from the drive-in. I also spent a lot of that free time baking cookies (or boxed cakes or making magazine collages) whilst chit-chatting with my girlfriends. Though I never Instagram-ed or took phone pictures of those cookies since I only had a cell phone my senior year, had about 4 numbers in it, and it was a huge, red, Nokia-brick with a pull-out antennae…no camera in sight. 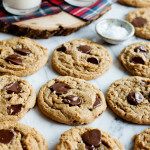 Truth be told, whenever I made chocolate chip cookies, I would always make the recipe on the back of the chocolate chip bag. Sometimes I would add some huge scoops of peanut butter to the dough, sometimes I’d add walnuts, I almost never measured as carefully as I do now, but basically, I never deviated from that classic recipe. Now that I bake much more and many more things, I have tried many a cookie recipe and I think these chocolate chip cookies may be my favorite yet. They are super soft, tender, a little thick–which is how I love my chocolate chip cookies–and packed with lots of dark chocolate. There’s cream cheese in this dough, which adds to the tenderness, as well as contributing a pleasant tang to the buttery, toffee-like flavor of the dough. These cookies don’t bake up flat, but pleasantly domed with a little chewy edge with soft middles. 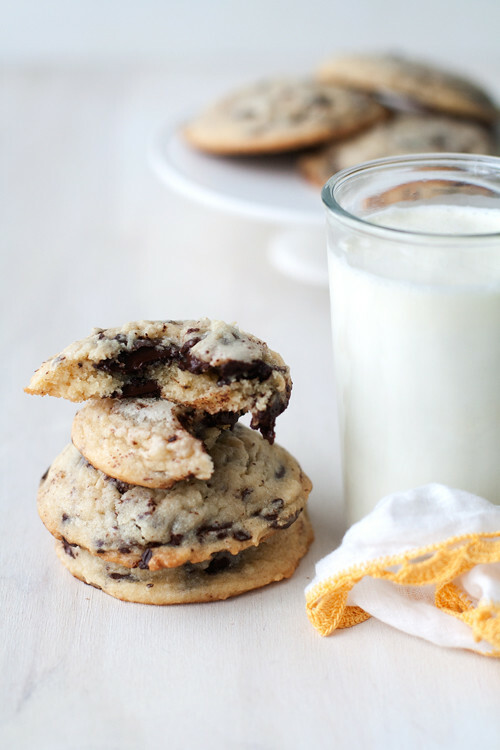 In my opinion they are pretty much perfect and definitely worth trying out…because, honestly, there are never too many chocolate chip cookie recipes in the world. Baking powder is not the same as baking soda. Baking powder has baking soda plus an acid added to it to create the lift necessary in this recipe. Science! Don’t forget the salt! I used to think it was okay to just leave salt out of baked goods. Don’t be teen-me! Salt makes all sweet things sing. For most purposes, I use kosher salt, but sea salt is nice too. Parchment paper and waxed paper are not one in the same. Parchment is coated with silicone which ensures your baked goods will not stick and will also hold up to heat…waxed paper is coated with wax, will not ensure that you baked goods do not stick, isn’t meant to be heated (because wax melts! 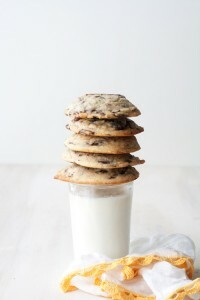 ), and will just break your cookie-lovin’ heart. Beating the butter, cream cheese, and sugars until fluffy will just whip air into your cookie, making it dry and crumbly, instead of soft and tender. The addition of cream cheese in these cookies makes them extra tender and soft, as well as adding a little bit of tang. In a mixing bowl whisk together the flour, baking powder, baking soda, cornstarch, and salt. Set aside. In a mixing bowl using a hand mixer, or in the bowl of a stand mixer fitted with the paddle attachment, beat the butter, cream cheese, and both sugars together until just combined, but not fluffy. Scrape the bowl and add the eggs and vanilla, mix to combine completely. Add the flour mixture you set aside earlier and mix until combined, scrape the bottom and sides of the bowl and continue to mix until everything is just mixed together, but well blended. Fold in the chocolate chips and place the cookie dough in the refrigerator for at least 30, up to overnight. Using a cookie scoop or 2-3 heaping tablespoons, scoop dough into balls and place onto a baking sheets about 2 inches apart. Bake for 14-16 minutes or until the edges begin to brown. Allow to cool at least 5 minutes before serving. 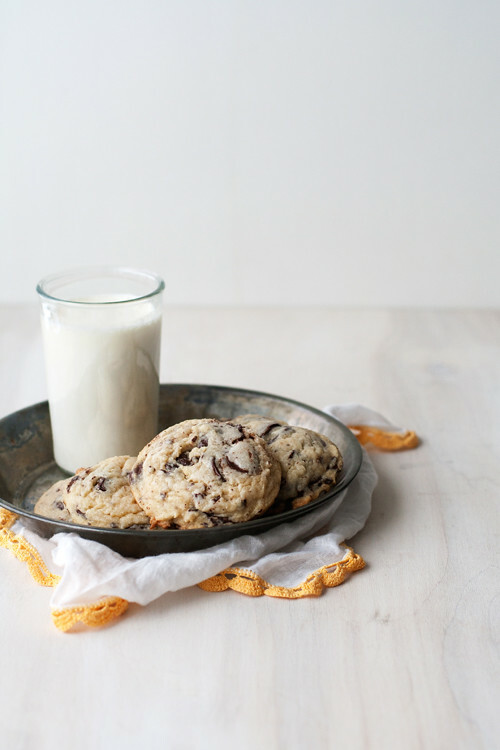 Nothing says I love you like a super soft chocolate chip cookie! I think a batch of these are in order TODAY! Sweet goodness, these cookies look perfect! LOVE! Loved reading this post! I too loved making and still do magazine collages. It’s on of my favorite things! I too always used to make the cookies recipe on the back of the bag (and still do a lot of the time! ), BUT I need to try these because they look insanely delicious. Cream cheese is genius! Oh and how cool that you high school contacted you? Crazy and awesome! It was so crazy and weird! Especially since it’s been nearly 12 years since I was a student there! Thanks, Tieghan! Magazine collages forever! Adding cream cheese to cookies = great idea. Definitely going to give these a try! YES! I hope you do! Thanks, Aida! They are totally an easy cookie to love! I hope you try them, Synove, and that you love them :)! Talk about wearing many hats! Wow, I love how involved you were. I think we would have made good high school friends (says the weirdo ex-drum major of the marching band). I think I did so many activities out of boredom, haha! We could have totes been friends! Thanks, Heather! I didn’t know you went to high school in the middle of the state! How cool. And how amazing that they contacted you–look at you, inspiring today’s youngins with cookies! I did! It was weird! ha! Whipped cream cheese! 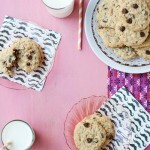 In chocolate chip cookies! Yes, please! Okay, I used 3 exclamation marks in a row. I must be excited. I mean, whipped cream cheese is worth getting excited about! Thanks, Steph! Yum! 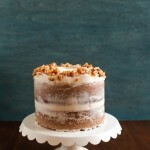 Adding to my must-bake list (as soon as this cleanse is over). Love the idea of adding whipped cream cheese–so brilliant! Way to stick to that cleanse! You definitely earned a cookie or two! yes! magazine collages always! thanks! 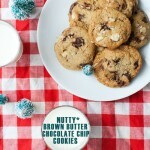 Love the idea of adding cream cheese to the cookies.. I’ll have to try that asap.. Loved reading this post.. Magazine collages fo dayz.. Yes! I hope you try it. and do teens still make magazine collages? I sure hope so. I loved hearing about the high school you – I can totally relate to still being weird, but now that I’m older I’m ok with it. In fact, I think weirdness is cool. 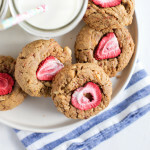 And these cookies – well, they are calling my name! Thanks for the soft cookie tips! I think most of us were weird teens, but that’s probably normal! Thanks, Amanda! Thanks so much for participating in the Career Wall. Megan and Taylor made your awesome chocolate chip cookies! Handed them out to all the student at ECHS! Wonderful! You look awesome on the “wall” . I’ll send you pictures soon! Yay, Cindy! If only there was a “most likely to be the best chocolate chip cookie baker” superlative, you’d totally have won :) I always love your chocolate chip cookie spins! Sometimes I miss that old Nokia brick phone! I used to call mine box phone. I love the addition of cream cheese, so genius. haha, it was so clunky! Thanks, Stefanie! I’ll admit, a lot of times I STILL use the recipe on the back of the chocolate chip package. Bad! If a seasoned cookie baker like yourself says these are the best ever, than I better try them ASAP! Cindy, this is maybe the coolest collaboration I have ever seen :) It’s amazing how blogging has become a totally viable career in the past few years–something I never could have even imagined back when I was taking those career tests in high school. And yes, former high school weirdos unite! PS: these cookies look freaky good. Does this recipe have both baking powder and baking soda? I only see baking powder listed in the ingredients section, but the directions say both powder and soda…? Thank you, these look AWESOME! It should be 1/2 teaspoon soda. Sorry about that! 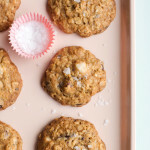 I am a sucker for any cookie recipe. These look perfect!